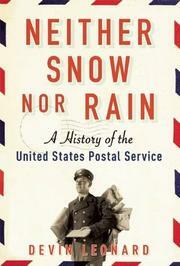 In his lively debut history, journalist Leonard, a staff writer at Bloomberg Businessweek, chronicles the evolution of the nation’s postal service through the many colorful, sometimes eccentric, personalities that shaped it. The author begins with Benjamin Franklin, who served under the British crown, overseeing postal service finances from London. After the Revolution, Franklin became the first postmaster general, a job he quickly left to become America’s ambassador to France. Nevertheless, Franklin and George Washington shared the conviction that the postal service could “be a force that promoted enlightenment, circulating newspapers and political documents that would guard the public from tyrants and demagogues spreading misinformation.” In addition, mail delivery could create a sense of connection among distant towns in the growing nation. When Alexis de Tocqueville visited in 1831, he praised the postal service as “the great link between minds.” Although there were more than 20,000 miles of post roads by the turn of the 19th century, the cost of sending letters was high, and many communities were not served, spurring competition. Henry Wells, the founder of Wells Fargo, began a delivery company in 1841; for 18 months, the Pony Express—later celebrated and romanticized—offered delivery, on horseback, in California. Free home delivery began in 1861, a much-applauded innovation, although during Arthur Comstock’s long reign as special postal inspector, the content of those deliveries was subject to investigation for obscenity. Philadelphia department store owner John Wanamaker emerges as a hero, pushing for reforms such as rural free delivery and parcel post. It was so cheap to send a package that some parents affixed stamps to their children for delivery to relatives rather than buy train tickets. Air mail, the rise of unions, financial troubles, zip codes, and the phenomenon of “going postal” are all subjects of Leonard’s brisk, informative narrative. A spirited look at the business and impact of delivering mail.